To love and serve God and our neighbors by offering to the people of Tallahassee meaningful worship services rooted in the tradition of Episcopal liturgy and music, a high-quality education to young children in our day school, opportunities for fellowship, and outreach ministries that serve the community and the world. 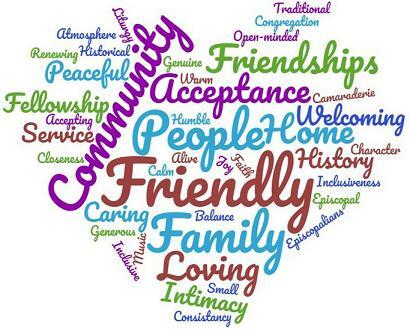 To be an inclusive and accepting congregation that welcomes all who want to love God by serving the community through programs of outreach and giving. We are a small congregation (average Sunday attendance is about 120 between both services), diverse in our views and opinions, yet united in our love and respect for one another. Our theologically progressive congregation greatly values traditional worship, a vibrant music program, diverse educational opportunities, and participation in community outreach. Church members find fellowship and participation in church activities to be very meaningful in their lives. 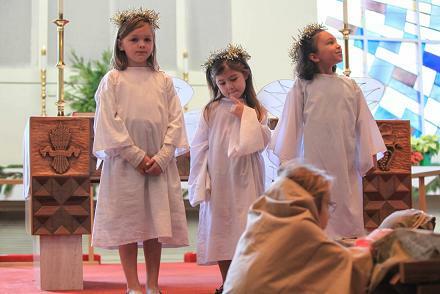 Thirty-four percent of the members have worshipped at Advent for over 20 years, while others have joined the parish more recently from other traditions. More than half of our parish members are age 65 or older and 43 percent of members have post-graduate degrees. We recently completed a congregational assessment by Holy Cow! Consulting. The survey revealed that our members are most satisfied when there is a spirit of involvement, strategic leadership, the ability to discern gifts, and exceptional worship services. Members of Advent frequently describe our church as a family, and we enjoy gathering for worship, meals and activities, and in support of one another in times of need. Click the following link to view the Congregational Assessment Results. 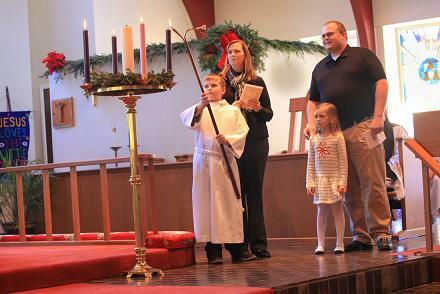 Advent celebrates three weekly Eucharistic services. On Sunday, early worshippers gather at 8:30 am in St. Clement’s Chapel for a quiet, contemplative service without music. At the 10:30 am service, the service includes a full choir. Both services typically follow Rite II, except for special occasions. There is also a Healing Eucharist with Anointing and laying-on-of-hands every Wednesday at noon in St. Clement’s Chapel. Our worship is greatly enhanced by an excellent music program. During the 10:30 am Sunday service, music is provided by our choir director and choir members who have performed works by Schubert, Durufle, and Mozart, among many others. Although most music is accompanied by the organ and piano, other instruments are included on special occasions. Special music has included Advent Lessons & Carols; Morning Prayer; Evensong; and choir concerts, often accompanied by instrumentalists, including a string quartet, French horn, trumpet, and cellos. Most hymns are selected by the choir director from the Episcopal hymnal. 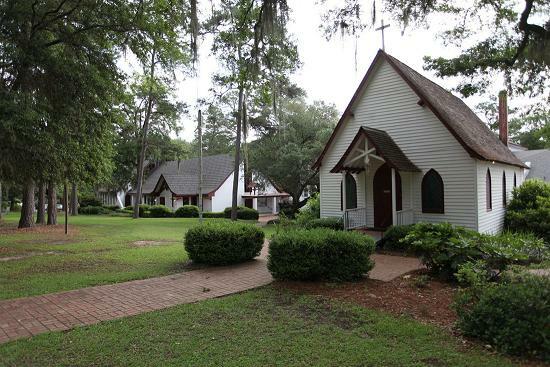 In 1858, The Right Reverend Edward Hamilton West, the Fifth Bishop of Florida, envisioned a need for a new Episcopal parish on the north side of Tallahassee. In December of that year, Bishop West called The Reverend Harry B. Douglas to address this need. Father Douglas, who at that time was Director of Camp Weed, the Diocesan Youth Camp, began the process of organizing a mission church, which would grow into the Episcopal Church of the Advent. Services began on Sunday, March 1, 1959, in what was then Yon’s Hardware Store at the intersection of Thomasville and Betton Roads. Incorporating an old door on concrete blocks as an altar, an altar cloth borrowed from St. John’s, a service book from the Chapel of the Resurrection, and candlesticks from Holy Comforter, 44 congregants participated in this initial service. At that time, the congregation of St. Clement’s Episcopal Church in the neighboring Town of Lloyd had experienced such a serious decline both to the membership and the structure that Bishop West declared St. Clement’s to be inactive. In June 1959, he made the building available as a home for Church of the Advent. A six-acre site on Piedmont Drive in Tallahassee, donated by Dr. and Mrs. C. K. Wall, became the new home for this historic 1895 Gothic-style church building consecrated by Bishop Weed in 1910. Extensive restoration by congregants led to rededication as St. Clement’s Chapel of the Episcopal Church of the Advent on Advent Sunday, 1959. Construction continued with a Rectory in 1962 and dedication of Advent Church and Parish Hall in April 1966. On April 16, 1966, The Episcopal Church of the Advent became the fortieth parish in the Diocese of Florida. With the establishment of Advent Day School in 1971, a significant educational outreach and evangelical resource became available to the congregation and to Advent’s ministry in the Tallahassee Community. In 2006, a significant percentage of the congregation and its two priests expressed their displeasure with National Church decisions about the inclusion of gay people in clerical leadership by leaving Advent Church. Needless to say, this resulted in a challenge to the stability and growth of the membership. It is to the credit of remaining members and several new clergy that the congregation moved beyond this separation event and remains on a path to full recovery and growth. The following Church By-Laws were approved by the full congregation at the Annual Meeting on Sunday, February 4, 2018 after the 10:30 am service.